Simple plot of yearly average dew points by year, season, or month. This calculation was done by computing the mixing ratio, then averaging the mixing ratios by year, and then converting that average to a dew point. This was done due to the non-linear nature of dew point when expressed in units of temperature. 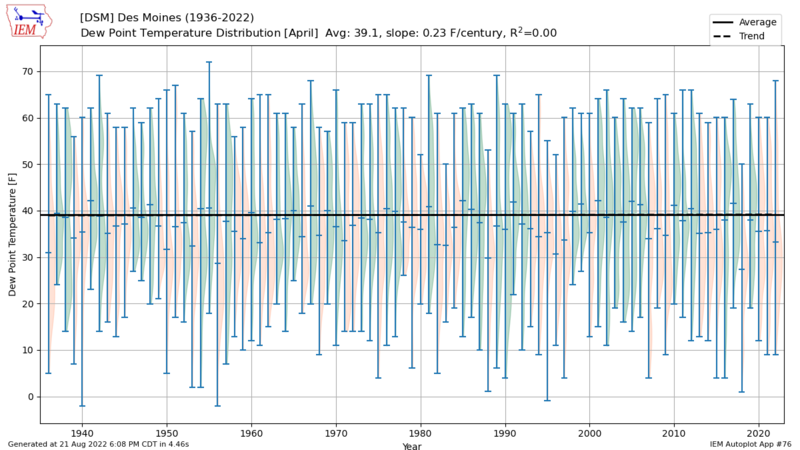 If you plot the 'winter' season, the year shown is of the Jan/Feb portion of the season. If you plot the 'Water Year', the year shown is the September 30th of the period. You can optionally restrict the local hours of the day to consider for the plot. These hours are expressed as a range of hours using a 24 hour clock. For example, '8-16' would indicate a period between 8 AM and 4 PM inclusive. If you want to plot one hour, just set the start and end hour to the same value. Based on a sampling of recent timings for this application, plot generation time has averaged 5 seconds. Hold on for the plot is generating now!